The revelations come thick and fast in “Eastwatch”, the fifth episode of Game of Thrones’ seventh season. A few of the major ones: Gendry is back, and swinging a hammer like his belated father; Littlefinger is trying (and possibly succeeding) at some scheme that involves hoodwinking Arya; Jon is probably not just Rhaegar’s son, but a legitimate one, and Cersei and Jaime have another child on the way. Not to forget, the Night’s King is on the march, probably in the neighbourhood of Eastwatch by now. Though at this point, the only characters in the show not capable of extra quick travel are the White Walkers and their army of the dead, a small blessing for the living residents of Westeros. Given the number of revelations listed, you’d be correct in assuming that a lot of stuff “happened” in this episode. Some of the other major plot points: Jaime is alive, and meets with Tyrion, not entirely of his own volition, to hear terms from Daenerys. Sansa is still holding down the fort in Winterfell, and possibly winning the loyalty of the lords both northern and western in the process, much to Arya’s discomfort. Sam, tired of trying to convince learned old men of the immediate threat in the north, abandons his studies at the Citadel. 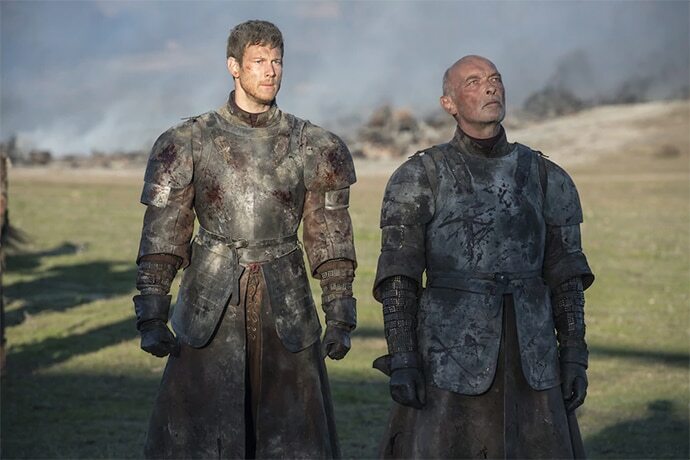 Randyll Tarly and his son Dickon are roasted alive by the fires of House Targaryen for refusing to bend the knee to Daenerys — thus does one greater housees fall in this long drawn-out war. And Jorah, now back on Dragonstone and fully healed, is part of a seemingly crazy mission led by Jon and Tormund (with an assist from the Hound, Beric and Thoros, who have conveniently landed up at Eastwatch) to “bring back” one of the soldiers of the dead, in an effort to convince Cersei that winter has come, and all the claimants to the Iron Throne might as well put their squabbles aside in the face of this much larger threat to their, and all of humanity’s existence. It seems like a bit of a harebrained scheme, but stranger things have happened, such as a man rising from the dead with his will intact (I’m looking at you, Jon). Still a big mystery: what in the name of R’hollor is happening to the Unsullied at Casterly Rock, and why does no one seem to care? 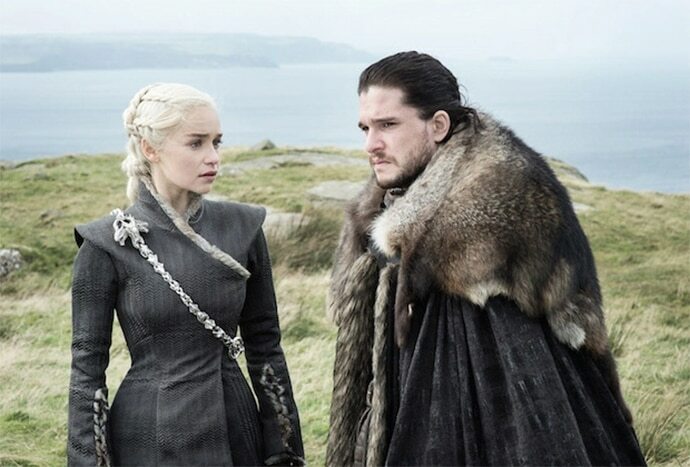 “Eastwatch” continues the themes that have been blazoned through this show for years: what is the "right" way to rule, or claim power? Dany’s dreams of a bloodless, dragon-free accession to the Iron Throne have literally crumbled to dust, a fact rather beautifully illustrated by Tyrion’s walk through the remnants of the Lannister army. Dany continues her savage display with her burning of the Tarly lords, which leaves Tyrion looking very worried. 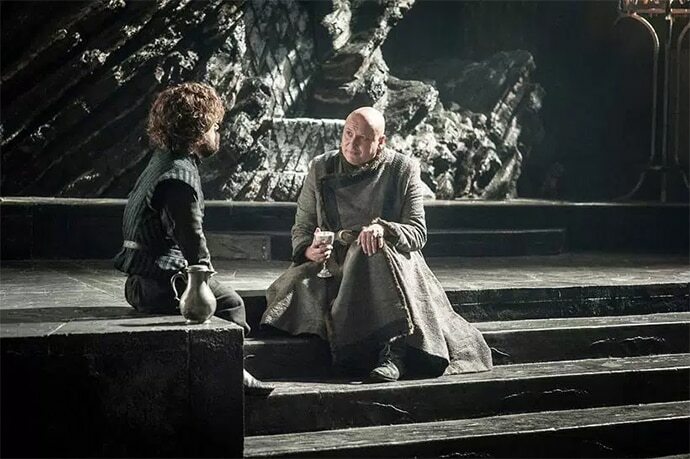 His chat with Varys later shows that Dany’s increasingly arsonist tendencies continue to bother him and it’s with a hint of defensiveness that he says Dany is and will be nothing like her father. Things are never simple in the world of GoT, and perhaps it was a bit of a delusion to imagine that Daenerys, a relatively pure and idealistic character, would continue to remain so in this fight. We’ve seen how pure and unbending characters end up, and it’s usually with their heads on pikes. Just ask the Starks. Speaking of the Starks, their homecomings have been far from the wonderful things we might have hoped for. As Sansa reminds Arya, and us, they didn’t simply ‘come home’ to Winterfell, they “won it back” from a depraved, sadistic ruler by “working together” with other houses. The sisters have always been used to illustrate polar opposites: the conventional, well behaved beauty versus the tomboy rebel; the mediator and conflict avoider opposed to the anarchic avenger. Sansa and Arya are both equally ruthless when it comes to getting what they want (Sansa perhaps coming to this stage later than Arya), but the methods they use to get these things are so very different that they cannot seem to, at this point at least, come to a common understanding, or just sit down and talk about what they each want. For Arya, that seems simple: a return to the home she’s long dreamt of and often given up on, under the rule of her half brother. For Sansa, it’s slightly more complicated, a result of her much longer, and more thorough, political education. What drives people, and creates their motivations? For Cersei, that answer has always been simple: her children. With this new pregnancy, she has a chance to do it all over again, this time in power, and with her brother really, romantically, at her side. “Who will you say is the father?” Jaime asks, hardly believing this latest development, and Cersei’s answer is simple: “You.” The Lannisters have been denied a dynasty for the whole first half of the season. With Cersei’s pregnancy, they have something besides themselves to fight for, a fact which has always made this family, already among the most ferocious on the board, even more leonine. They have proven themselves capable of doing truly crazy things for love; perhaps entering into an armistice with them at this point is not entirely in Dany’s best interests, especially since we know how good they are fighting dirty. And finally, ending on that theme of potentially misinformed and stupid ideas: what to make of the new quest beyond the Wall? No ranging has ever gone well, and every time we’ve seen that gate be drawn up, watched characters wander into the blinding white of the "true" North, we’ve known that some of them, if not all, are not coming back. The tonal cues of Game of Thrones have always been telling, and the growing silences that have enveloped this season are quite portentous. Scenes beyond the Wall, in particular, have never had stirring music, apart from a few intimate instances involving Ygritte and Jon. The presence of the White Walkers, notably, has always been heralded by a haunting, almost minimalistic melody, compared to the heavier or more dramatic tones that are associated with various characters. Ramin Djawadi’s work, as composer for the show, has not only highlighted themes and moods throughout Westeros and Essos (Dany just wouldn’t be the same without her stirring, voice-accompanied tunes, nor would Wintefell evoke quite the nostalgia it does without those mournful strings), and his dialling back in this season can only mean one thing: bad things are coming, and nothing, no music, nor sound apart from the tiniest hints, can truly prepare us for them.